In this excerpt from his new book, Fixing the Game author Roger L. Martin examines what the NFL can teach the business world about managing expectations and how CEOs are rigging the game. Few people conceive of the world of business in terms of real and expectations markets. Yet, there is another world in which the distinction between a real market and an expectations market is much more profoundly understood — the National Football League (NFL). While it isn’t a perfect metaphor for business, it is a highly instructive one. The NFL is, far and away, the most successful sports league in America. Regular season NFL games regularly garner higher ratings than the final round of golf ‘s Masters, the Kentucky Derby, the Daytona 500, baseball’s all-star game, the most watched National Basketball Association final game, and college basketball’s Final Four title game. The 2010 Super Bowl was the most-watched television event in history, with more than 106 million American viewers. According to Forbes, of the twenty-five sports teams worth more than $1 billion, nineteen are from the NFL. No sport comes close to the NFL’s economic power. In the NFL, the real market operates when teams take to the field on Sunday and play a game for sixty minutes, making real runs, passes, blocks, and tackles. Real touchdowns and real field goals are scored. There is a real winner and a real loser. Coaches and players are in full control of what happens in the real game (referees notwithstanding). Then there is the NFL’s associated expectations market: gambling. Gamblers try to guess who will win a given game on a given Sunday and place bets based on that expectation. If the game were to be played between two equally matched opponents, we would expect that roughly half of the bettors would select one team to win and half would select the other — creating a perfectly efficient market with a balance of bets on each side. Of course, that rarely happens. One team is playing on the road, one team has a stronger quarterback or has a poor rush defense. So the Las Vegas bookmakers — the folks who run the expectations market — dynamically balance the bets on either side through the use of a point spread. If more people expect that the Dallas Cowboys will beat the Detroit Lions, the bookies will give points to the Lions. This means, if you’re betting, that instead of betting on Detroit to win the game, you bet that Detroit will either win the game or, importantly, lose by less than the point spread. Imagine that the point spread is Dallas by 4.5 points. If you wager on Dallas to win, Dallas would need to win by 5 or more points for the bet to pay off. If you bet on Detroit, the Lions would need to win or lose by 4 or fewer points for the bet to pay off. From the time betting opens until kick-off, the point spread moves according to the bets placed, settling to a point of equilibrium where roughly half the money is bet on Detroit and half on Dallas. The point spread in football is the analog to a stock price in business. The collective expectations of all participants in the market determine both a point spread and a stock price. If more bettors put money on the favored team, the point spread will increase; if more investors buy a stock at a given price, the stock price will rise. In both the NFL and in business, as the real game grew in stature and prominence, the expectations game became more and more sophisticated. In both cases, dedicated individuals emerged to ply their trade in the expectations market, becoming NFL bookies or bettors, capital markets brokers or investors. But unlike American capitalism, the NFL looked thoughtfully at the relationship between the real game and the expectations game and identified a serious danger. After the 1962 season, Paul Hornung, the Green Bay Packers halfback and the league’s most valuable player (MVP), and Alex Karras, a star defensive tackle for the Detroit Lions, were accused of betting on NFL games, including games in which they played. Pete Rozelle, just a few years into his thirty-year tenure as league commissioner, responded swiftly. He suspended Hornung and Karras for a full season, and fined five Lions players who admitted to placing $50 bets on that year’s Championship game between the Packers and the Giants. Rozelle also created NFL Security — what is often called the NFL’s FBI — to work with law enforcement agencies across the country to detect and stamp out player involvement in betting on the NFL. Why did Commissioner Rozelle take such a definitive stand against players and coaches betting on football? He must have envisioned the consequences if he didn’t. Let’s imagine that the Lions are playing against the Minnesota Vikings, and the Lions are favored to win by 10 points. The Lions players know their team is better than the Vikings and will almost certainly win the game. So, one of them conspires with some unscrupulous bettors to wager millions of dollars on the Vikings. The player then does all he can to ensure that the Lions win the game, but by 9 or fewer points. He has engaged in the art of point shaving, sacrificing a few points of advantage in order to win the game by a lower margin than the prevailing point spread. And he’s made a lot of money for his friends. Executed with precision, point shaving doesn’t damage the team’s record in the real game. But imagine if the culprit is willing to hurt his team’s record in the real market for a short period; in that case, he could try to cause his team to lose a couple of straight games — a practice colorfully known as tanking — so that the subsequent point spread is relatively easy to beat. He could then bet on winning that subsequent game and make a killing. By altering the on-field dynamics, point shaving and tanking have the potential to undermine the integrity of the league and dramatically diminish the experience for fans. Rozelle recognized this, and so did all he could to prevent them from taking root in his league. Rozelle and the team owners observed that even though the expectations game of betting on football sprang from the real game, it was played by very different rules. They clearly saw that the pressures of the expectations game could do serious damage to the real game. Like a parasite that eventually kills its host, sports betting had the ability to destroy the sport. So Rozelle and his successors, Paul Tagliabue and Roger Goodell, have enforced a strict separation between the real market and the expectations market; everyone involved in the real game of football — players, coaches, and officials alike — are forbidden to have anything to do with betting on football — on their own games or on other teams’ games. Even spending time with known gamblers and bookies is strongly discouraged. In other words, the NFL has managed the division between the real and expectations market in a manner that is exactly the opposite of the way we have managed it in business. American capitalism encourages, and in many cases even mandates, the players in the real game to invest heavily in the expectations game, and has built structures that bring the key players from the two markets into almost constant contact. CEOs are given significant (if not overwhelming) amounts of stock-based compensation to ensure that they focus first and foremost on shareholder value maximization. Those same CEOs interact with capital-market participants frequently, providing guidance to them about likely future performance so that folks can place their bets — oops, that’s make their trades — with appropriate information. Imagine an NFL coach holding a press conference on Wednesday to announce that he predicts a win by 9 points on Sunday, and that bettors should recognize that the current spread of 6 points is too low. Or picture the team’s quarterback standing up in the postgame press conference and apologizing for having only won by 3 points when the final betting spread was 9 points in his team’s favor. While it’s laughable to imagine coaches or quarterbacks doing so, CEOs are expected to do both of these things. In fact if they don’t, the CEO and company can be slapped on the wrist by regulators and even sued for not alerting shareholders that their expectations for the quarter were off the mark. In American capitalism, a tight connection between the real and expectations markets is now ensconced in our legal framework. Of course, one could argue that the games of football and business are sufficiently different, that CEOs can’t engage in activities like point shaving and tanking after placing bets. Or can they? With respect to point shaving, it is clear that CEOs and CFOs do steer their companies to the consensus earnings forecast of the Wall Street analysts. If shareholder value is what matters, then they will deliver exactly what is expected of them in that arena, real performance be damned. Consider the following trend: in the 1980s, CEOs met corporate guidance about 50 percent of the time; by the mid-1990s, they did so 70 percent of the time. Companies are getting better and better at meeting expectations exactly. And rarely do companies surpass expectations by a significant measure. Why? Because if a company beats expectations this quarter, the expectations will be that much higher for the next quarter and that much harder to meet. The capitalist incentive for point shaving is at least as strong as it would be in the NFL, and there is good reason to believe that plenty of CEOs do it, and often. Tanking happens in companies too. CEOs rarely miss their consensus forecast by a small margin. They either hit the “number” or they fall short by a long shot. In effect, they tank; they take a big fall in one quarter in order to reset expectations at a much lower level, which allows them to perform wonderfully against that low base of expectations. Reprinted by permission of Harvard Business Review Press. 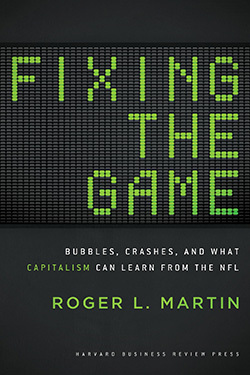 Excerpted from Fixing the Game: Bubbles, Crashes, and What Capitalism Can Learn from the NFL. Copyright 2011 Roger L. Martin; All Rights Reserved.